Lately I’ve been working on a custom game engine using Microsoft Visual C++ Express 2012 for Desktop. The project compiles into a dynamic library that will be linked to the main application that defines the game. The thing is I wanted to keep track of this engine version. I placed a major and minor version numbers, but I also, for the sake of curiosity, keep a build number. This number should increment every time a successful build of the project is performed. It will be reset when the minor version changes. That way I can keep track of how many different builds the project has have to a given major and minor version. Obviously, I don’t want to manually increment that number. I could forget to do it, but more importantly, it will bore me. I’m really lazy. There are some free add-ins for Visual C++ that provides this feature out of the box (example). Unfortunately, the Express edition of Visual c++ does not allow you to install non-Microsoft add-ins, so it’s not a solution for me. Store the build number in a header file, for example version.h. Create a script that increments a #define macro in version.h. Execute this script every time Visual C++ performs a successful build. It will be important to make sure the modified file timestamp corresponds to the original one in order to prevent having to build the project just for that. Although macros must be avoided at all cost, in this case it is the easier way to show this solution. Increment, replace, and print the modified version.h to a temporal file using awk. Keep the original timestamp for the temporal file using touch. Rename the temporary file to the original one using cp and rm. The first task is performed by the awk script. You can read the manual for a full description. It basically prints all lines of version.h which don’t match the string “#define _MYPROJECT_BUILD”. For the lines that match that string, they find the value in the third column (columns are separated by spaces), add one, and then reprint the line. Notice that the script could need adaptation for your particular implementation. The modified version.h file is stored in version_temp.h. We don’t modify the file in place because we want to keep track of the original timestamp of the file. This is needed so Microsoft Visual C++ does not notice the file has been updated and thinks the project needs to be updated. The timestamp of the original file is copied to the temporal file by the touch command. Then, we copy the temporal file to its final destination preserving all the relevant information (timestamp) using the -p modifier in cp. Finally, we remove the temporal file. 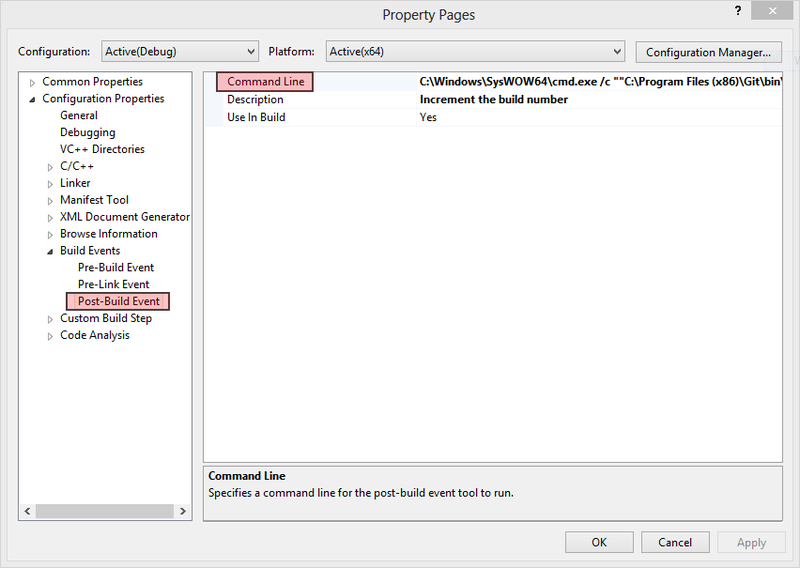 Notice that the post-build event is executed from the project directory (SolutionDirProjectDir in my case) . That’s why the script refers directly to ‘version.h’ and ‘version_temp.h’ while the post-build hook refers to ‘../tools/post-build’. And that’s it. Every time the Visual C++ project is successfully built the post-build script will update the ‘_MYPROJECT_BUILD’ macro value. In addition, as the timestamp of the file is preserved in the process, this change doesn’t trigger a project rebuild of the version-dependent files. Keep in mind, however, that to update the build number in the application you will have to force a rebuild of the system. Don’t forget that when you want to release a particular build of your application.